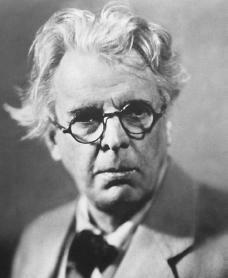 William Butler Yeats was an Irish poet and dramatist (playwright). Some think he was the greatest poet of the twentieth century. He won the Nobel Prize for literature in 1923. The works of William Butler Yeats form a bridge between the romantic poetry of the nineteenth century and the hard clear language of modern poetry. sciences and in his highly original system of aesthetics (beauty). At the age of nineteen Yeats enrolled in the Metropolitan School of Art in Dublin, intending to become a painter. In 1887 he became a literary correspondent for two American newspapers. Among his acquaintances at this time were his father's artist and writer friends, including William Morris (1834–1896), George Bernard Shaw (1856–1950), and Oscar Wilde (1856–1900). In 1889 Yeats met the woman who became the greatest single influence on his life and poetry, Maud Gonne. She was Yeats's first and deepest love. She admired his poetry but rejected his repeated offers of marriage, choosing instead to marry Major John MacBride. Gonne came to represent for Yeats the ideal of feminine beauty—she appears as Helen of Troy in several of his poems—but a beauty disfigured and wasted by what Yeats considered an unsuitable marriage and her involvement in a hopeless political cause, Irish independence. Yeats became a founding member of literary clubs in London, England, and Dublin. During this period he became friends with the dramatist John Millington Synge (1871–1909). He was introduced to Synge in 1896, and later directed the Abbey Theatre in Dublin with him. The American poet Ezra Pound (1885–1972) came to London for the specific purpose of meeting Yeats in 1909. Pound served as Yeats's secretary off and on between 1912 and 1916. Pound introduced Yeats to the Japanese No drama (a form of Japanese theater similar in many ways to Greek tragedy). Yeats's verse dramas (plays in the form of poetry) reflect the ceremonial formality and symbolism of No . The death of Maud Gonne's husband seemed to offer promise that she might now accept Yeats's proposal of marriage. She turned him down in 1917. He proposed to her daughter, Iseult MacBride, only to be rejected by her too. That same year he married Miss George Hyde-Less. Soon after their wedding, Yeats's new wife developed the power of automatic writing (writing as though coming from an outside source) and began to utter strange phrases in her sleep that she thought were dictated by spirits from another world. Yeats copied down these fragments and incorporated them into his occult aesthetic system, published as A Vision in 1925. A daughter, Anne Butler Yeats, was born in 1919, and a son, William Michael, two years later. Yeats's first book of poems, The Wanderings of Oisin and Other Poems, was published in 1889. In the long title poem he began his celebration of the ancient Irish heroes Oisin, Finn, Aengus, and St. Patrick. This interest was evident also in his collection of Irish folklore, Fairy and Folk Tales (1888). His long verse drama, The Countess Cathleen (1892), was a combination of modern dramatic forms with ancient beliefs and modern Irish history. He followed this with his collection of romantic tales and mood sketches, The Celtic Twilight (1893). Yeats's Secret Rose (1897) includes poems that he called personal, occult, and Irish. More figures from ancient Irish history and legend appeared in this volume. The Wind among the Reeds (1899) won the Royal Academy Prize as the best book of poems published that year. An important milestone in the history of the modern theater occurred in 1902, when Yeats, Maud Gonne, Douglas Hyde, and George Russell founded the Irish National Theatre Society, out of which grew the Abbey Theatre Company in 1904. Yeats's experience with the theater gave to his volume of poems In the Seven Woods (1907) a new style—less elaborate, less romantic, and more straight forward in language and imagery. Some of Yeats's plays show his great interest in ancient royalty and "half-forgotten things," but his poetry was unmistakably new. Yeats's play At the Hawk's Well, written and produced in 1915, showed the influence of Japanese No drama in its use of masks and in its dances by a Japanese choreographer. From 1918 to 1923 Yeats and his wife lived in a restored tower at Ballylee (Galway), Ireland. The tower became a prominent symbol in his best poems, notably in those that make up The Tower (1928). Yeats was elected an Irish senator in 1922, a post he filled until his retirement in 1928. He received the Nobel Prize in Literature in 1923. His acceptance of the role and its responsibilities had been foreshadowed (predicted) in his poems Responsibilities (1914). The outbreak of civil war in Ireland in 1922 had heightened his conviction that the artist must lead the way through art, rather than through politics, to a harmonious (in tune) ordering of chaos. Yeats devised his doctrine of the mask as a means of presenting very personal thoughts and experiences to the world without danger of sentimentality (excessive emotions). By discovering the kind of man who would be his exact opposite, Yeats believed he could then put on the mask of this ideal "antiself" and thus produce art from the synthesis (combination) of opposing natures. For this reason his poetry is often structured on paired opposites, as in "Sailing to Byzantium." Yeats believed that history was cyclical (circular) and that every two thousand years a new cycle, which is the opposite of the cycle that has preceded it, begins. In his poem "The Second Coming," the birth of Christ begins one cycle, which ends, as the poem ends, with a "rough beast," mysterious and menacing, who "slouches towards Bethlehem to be born." Yeats's last plays were Purgatory (1938) and The Death of Cuchulain (1938). He died in Roquebrune, France, on January 28, 1929. He had retired there because of ill health. He had the lines of one of his poems engraved on his tombstone in Ireland: "Cast a cold eye / On life, on death. / Horseman, pass by!" Yeats was not only one of the greatest poets and a major figure in the Irish literary renaissance (rebirth), but also wrote some of the greatest of all twentieth-century literature. Jeffares, A. Norman. W. B. Yeats, a New Biography. New York: Farrar Straus Giroux, 1989. Larrissey, Edward. Yeats the Poet: The Measures of Difference. New York: Harvester Wheatsheaf, 1994. Macrae, Alistair D. F. W. B. Yeats: A Literary Life. New York: St. Martin's Press, 1994.